Halloween is an annual excuse to get weird and enjoy a great party. Along with the costumed fun comes creative drinks and that often includes a round or two of shots. Luckily, there are plenty of great shooter recipes that make the most of a Halloween theme. From those that taste like candy to powerful, biting mixes that could easily wake the dead, these potent little drinks are sure to be a hit. Candy corn is a Halloween staple and it's fun to create liquid versions of those tiny seasonal treats. The Candy Corn shot is made with Galliano, orange curaçao, and cream, creating a layered drink that's as fun to look at as it is to drink. Why eat your Tootsie Rolls when you can drink them? The popular candy has been turned into a Tootsie Roll shot more than once over the years. Whether it's with coffee liqueur and orange juice or chocolate vodka and amaretto, there's sure to be a version you can easily mix up (and throw back). Sticking with the candy theme, these candy corn oranges introduces the popular confection to the world of jello shots. 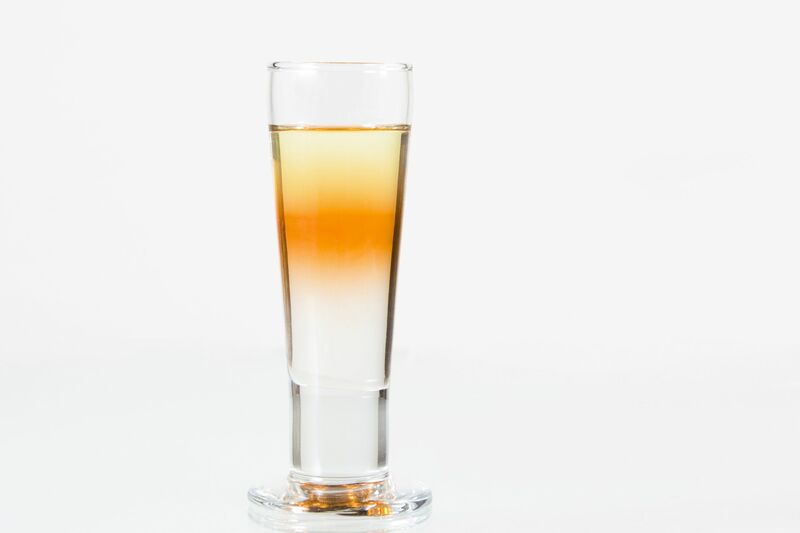 Featuring citrus-infused Cointreau and white layers of gelatin that are poured into an orange peel, you'll have a great time whipping these up—and everyone else will get a kick out of "drinking" the bite-sized shots. Nothing keeps the party going all night long like a shot of tequila. And it's even more potent when you add espresso to the mix! The two come together in the aptly-named Wake the Dead and are enhanced with a tequila-based coffee liqueur. It's an invigorating drink, to say the least. There's a lot going on in the Wolf Bite. The glowing green sipper is filled with fascinating flavors, including melon, pineapple juice, and absinthe. A dash of grenadine gives it a floating bloody effect. Add a funky trick to your party and serve a round of syringe shots. The Bloody Shirley Temple Syringe Shot is a great place to begin and it's very easy to mix up. All you need is cranberry vodka and lemon-lime soda. The Black Rose is a shot that'll speak to everyone's dark side. Start by pouring a strawberry cream liqueur, then use ebony-hued vodka to create swirls against the pink background for a stunning visual. Feel the zombie-like effects of the Mind Eraser at your party. It's a shooter that's drunk through a straw and the goal is to do it so fast, you get an instant head rush. The drink itself is nothing more than vodka, coffee liqueur, and soda, so it's incredibly easy to mix up. Add some rum-induced black magic to Halloween night with the Voodoo. This delicious shot combines coffee liqueur with rum cream, plus a float of overproof rum. It may be a short drink, but it packs a big punch. When your house is filled with zombies, few shots would be more appropriate than the retro Apocalypse Now, which features a potent combo of tequila, Irish cream, and dry vermouth. Vodka and lime juice form the foundation for the popular Kamikaze drinks. 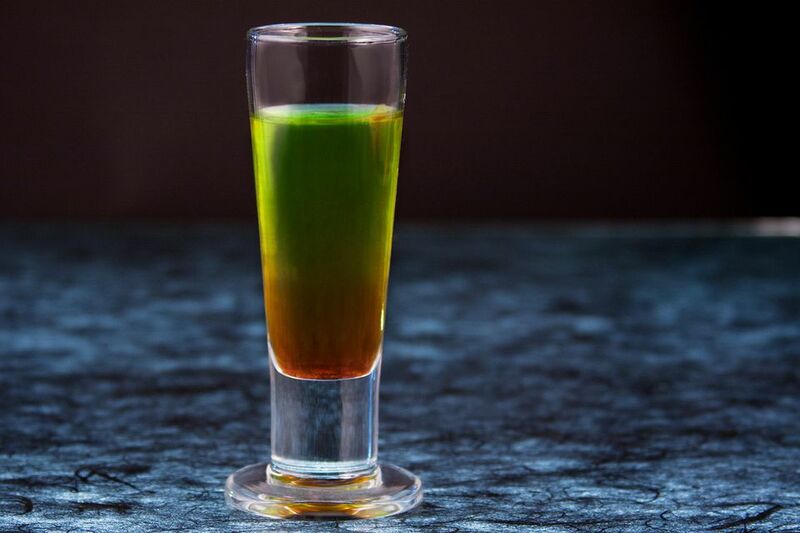 While it makes a great cocktail, the shooter version is even more fun and can be made extra interesting for Halloween with blue curaçao and backlit with glow sticks. Trekkies come out of the shadows on Halloween and the ultimate shot for "Star Trek" fans is the Beam Me Up Scotty. For this drink, you'll top coffee liqueur with a banana liqueur, then finish it up with Irish cream. One sip will prove why it's long been a longtime Halloween favorite. The Snake Bite is a shot you will not forget anytime soon. It's one that will make your head spin with its puckery kick and strong alcoholic bite. Featuring Yukon Jack and lime juice, it's easy to make, but definitely not for the faint of heart. Halloween is a great time to feel like a kid again and a shot like this is sure to help with that. The Bazooka Joe is an old-school shooter that tries to replicate the flavor of the popular gum with help from Irish cream, blue curaçao, and banana liqueur. Drinking and playing with fire should be done with caution, but that doesn't stop revelers from enjoying the Flaming Dr. Pepper. It's an entertaining one to serve while guests still have their wits about them and it's always a hit. If you choose to serve this one, be sure to blow out the flame before drinking it. Also, watch out for any fringe, wigs, and other flammable pieces of Halloween costumes because they can easily catch on fire.